The QuickAction Button can be found on in the top right corner of the ArcPad application. This big blue button is one of the most useful and versatile tools in out-of-the-box ArcPad. - When using ArcPad in Design Mode, the button will change color to red and the icon will change from ArcPad to ArcPad Studio. This is to give you a visual indication of when you are working in the ArcPad customization environment. - You can hide and unhide the QuickAction Button by selecting 'Toolbars' from the Quick Access Menu (small arrow on the left-hand side of the toolbars) and then checking or un-checking 'QuickAction' on the drop-down menu. Hiding the QuickAction Button, along with your other ArcPad toolbars can give you more space on your screen to display your map. But why would you want to hide this awesome blue button? 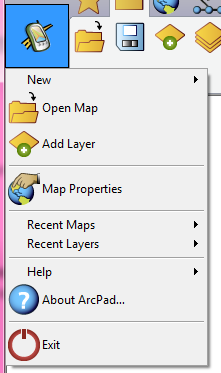 Without any configuration, the QuickAction Button gives you access to many useful tools including the 'New' menu, Map Properties, Recent Maps and Layers and the ArcPad Help. But - did you know that you can customize the QuickAction Button just like any other toolbar in ArcPad? When you put ArcPad into Design Mode and launch the Toolbar Editor (both functions can be found on the QuickAccess Menu - see the ArcPad Help for more information), the QuickAction Button is listed along with the ArcPad default toolbars. To add tools to the QuickAction Button, simply select QuickAction on the right, select the tool you want to add on the left and click on the right-facing arrows. To remove tools from the QuickAction Button, simply select the tool listed under QuickAction on the right and then click the left-facing arrows. You can also drag-and-drop tools to the left and right to add or remove them from your toolbars. I know that now you are thinking of all of the different ways you can customize the QuickAction Button in your own ArcPad Projects - be sure to leave a comment if you want to share what you have done! Hello. This is a nice menu that I'd like to have 're-activated'. I created a custom toolbar for a project, and now all that is in the Quick Action bar is quick project. How can I restore the original functionality of the Quick Action menu? Thanks. To return all toolbars to the default, simply delete your ArcPad.apx file. Then next time you start ArcPad, a new default one will be create, complete with default toolbars. ArcPad.apx is located in the \\Documents\My ArcPad folder. If you want to keep other custom changes in your ArcPad.apx, you can add the desired tools individually using the Toolbar editor inside either ArcPad or ArcPad Studio. You could also rename your ArcPad.apx file, launch ArcPad to create a new default one, and then open the two apx files in Notepad. 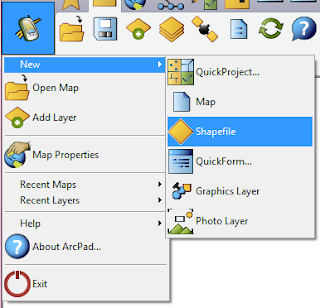 Copy and paste the tools and toolbars that you want, into the same file and save as ArcPad.apx. Thanks for your reply. I went with your last suggestion to delete the apx file, and it worked. I now have the QuickAction functions restored. Thank you.